Choose free range, grass fed or organic beasts where possible. Bones left over from a meal are fine, meaty bones add extra nutrition. If you do not have enough bones for a whole pot freeze them until you do. You need enough bones to fill your slow cooker to between a quarter or a third with bones. For hoofed animals try to include a trotter, knuckles and bones with exposed marrow. Browning the bones in a pan before hand will give a deeper flavour to the broth. Chicken – you can use the whole carcass, including the feet if possible. Fish – pop evertyhing in. Heads with eyes, bone and fins etc. What is in my pot in the photo above? 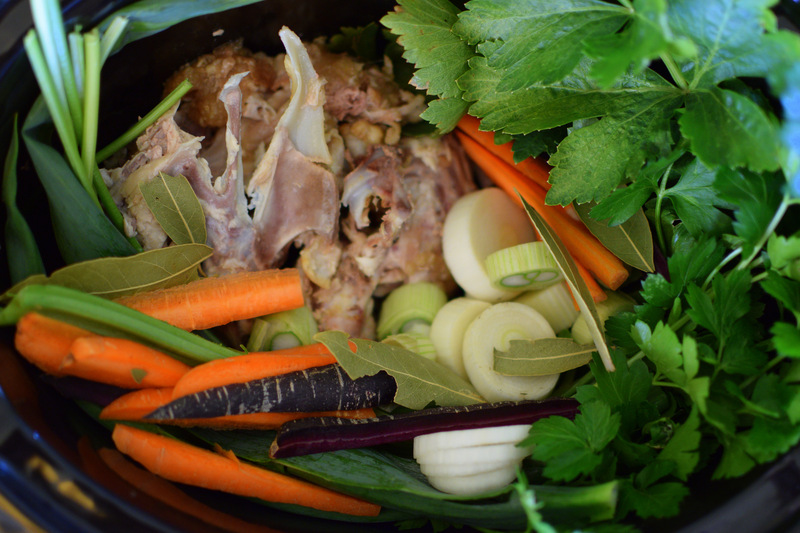 A local chicken carcass with a few garden veggies – a couple of carrots, some bay leaves, parsley including the stalks, some celery with leaves and an overgown spring onion! At the very least you need to add an onion or two and a few bay leaves. You can also throw in a handful of veggies and herbs – leeks, carrots, celery, parsnips, parsley, thyme, vegetable cuttings … whatever is fresh, seasonal and takes your fancy. Be careful with spices as the long cooking time can make them taste very strong in the broth. One spice I have found does work well, especially if you are going to use the broth for Pho (Vietnamese beef noodle soup) is star anise. Do not season your bone broth with salt, save this for when you use the broth later in your cooking. I just add a slurp of vinegar to the pot, for those of you who are pedantic I would equate this to a generous tablespoon. You need the vinegar to help release important nutrients from the bones such as minerals, collagen and amino acids such as glutamine. Top the slow cooker with filtered/spring/rain water, turn it onto low , walk away and let cook for 12 – 24 hours. Beef and lamb bones you can cook for up to 48 hours! On completion strain the stock into containers, pop what you will use in the next few days into the fridge and store any left over in the freezer. As time goes on you will develop more confidence with your broth and have your favourite vegetables, herbs and spices that you like to throw in with different types of bones. Just remember that fish and fowl bones have a lighter flavour and so you will need to keep the flavour of the other broth ingredients light too. Once you have mastered the art of bone broth you will have a constant supply for soups, stews, rissotos, braising … wherever in your cooking you need stock. A cup of bone broth a day is also recommended – just warm and then season with a pinch of natural salt, a twist of pepper and chopped fresh herb. Experiment, have fun and enjoy your no stress bone broth! Sarah it was great to meet you at EDB15. I need no convincing i love bone broth, very restorative. Chicken broth with soba and bok choy is my ultimate comfort food..
Thankyou Sandra, bone broth provides such a great nourishing base for so many dishes, giving them more nutritional oomph and deepening the flavour. It was lovely to meet you too at EDB15 … what a marathon!